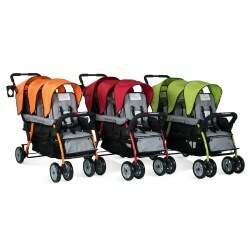 Kaplan's selection of strollers and buggies provide a safe way to bring infants and toddlers outside. 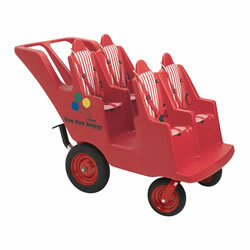 Products include buggies ranging from infant one-seaters to six-seaters for toddlers. 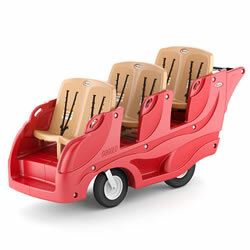 The cushioned, easy-to-clean, terraced seating ensures that every child has a good view. 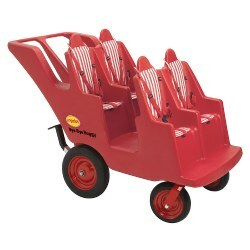 The buggies come with seatbelts, 360 degree pivoting front wheels, and safety breaks. 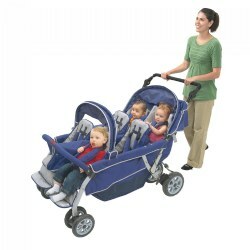 Kaplan also offers stroller connectors, baby seats, and buggy canopies to shield young children from the sun's harmful rays. 6 months & up. No-roll technology with the comfort-grip brake system. Easy to fold for storage. Sturdy tubular steel frame is lightweight for easy maneuvering. Fade-resistant fabric is water-repellent, yet easy to clean. Comfortable, padded reclining seats each hold up to 40 lbs. Removable canopies. Ample storage compartments. Locking foot pedal brake for extra safety. Conforms to ASTM F833-07A safety standards. All-terrain tires for any surface. Some assembly required. 3-year guarantee! 5 - 36 months. New flat free "Fat Tires"! Rugged, lightweight buggy simplifies excursions. Fits through most doors, maneuvers easily in tight spaces. Safety brakes. Cushioned, easy-clean, high-back terraced seats give everyone a good look at the world. Seat belts fasten easily. 360 degree pivoting front wheels. Fully assembled. Measures 42"H x 29 5/8"W x 74 1/2"L. Weight 151 lbs. Made in the USA. 5 - 36 months. New flat free "Fat Tires"! Rugged, lightweight buggy simplifies excursions. Fits through most doors, maneuvers easily in tight spaces. Safety brakes. Cushioned, easy-clean, high-back terraced seats give everyone a good look at the world. Seat belts fasten easily. 360 degree pivoting front wheels. Fully assembled. Measures 37 3/4"H x 29 5/8"W x 57"L. Weight 113 lbs. Made in the USA. Canopy sold separately. 5 - 36 months. 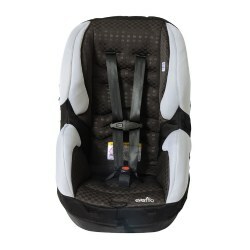 This rugged yet lightweight buggy has cushioned, easy-to-clean terraced seats with easy-fasten seat belts. The 360-degree pivoting wheels, with safety brake, allow for easy maneuvering in tight spaces and through standard doorways. Fully assembled. 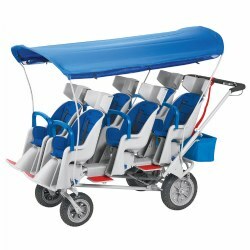 Canopies are sold separately. A canopy covers two seats. 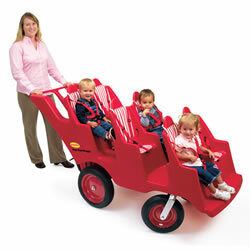 The Bye-Bye Buggy is everyone's favorite way to roll! 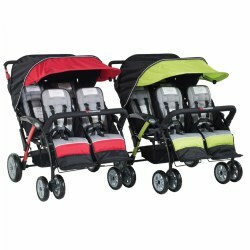 Rugged, lightweight buggy simplifies excursions. 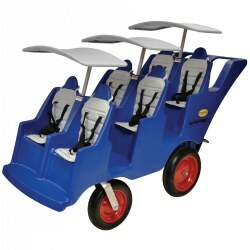 Fits through doors, maneuvers easily in tight spaces. Safety brakes. Cushioned, easy-clean, high-back terraced seats give everyone a good look at the world. Seat belts fasten easily. 360 degree pivoting front wheels. Fully assembled. Made in the USA. Choose Buggy and Accessories.